A Special Collection is an outreach program of San Miguel Corporation as part of their Corporate Social Responsibility. They started it in 2010. For SC 2012, they got participants from Cradle of Learners, Independent Living Learning Center, EM Castro Educational Foundation, Mandaluyong C.A.R.E.S – Project T.E.A.C.H., and a few other schools/institutions. The models they got are not slim, gorgeous models but teens with special needs: children with autism, with Down’s Syndrome, and Deaf. They chose as their beneficiary this year The Learning Center, a special school in Parañaque City that caters to the educational and therapy needs of special children. The workshop ran from November to February, culminating in a fashion show on 02 March 2012. My son Victor Lorenzo was recommended for the program by the Principal of Cradle of Learners, Mr. Rimando Raña, along with one other student Patrick Josh Valisno. Vinz readily agreed although at that early stage, he was not really aware of what was going to happen. During the 3-month workshop, the kids were trained to walk with confidence, to pose at intervals, to show their best angle in photos, and to wear their clothes with aplomb. It was not an easy task for the organizers, dance instructors, designers, photographers and other staff, especially for Teacher Eleanor Enriquez who was coordinating everything from beginning to end. The kids were not always easy to handle. Teacher Eleanor, with the help of the staff, had the costumes designed, coordinated with sponsors Onesimus, Yabang Pinoy and Agos for the clothes to be worn by the kids, bought some of the barongs and other items, organized the measurements and fittings, gave advice on appropriate accessories and shoes, and was on top of all the training and practices which happened every Sunday afternoon. Thank God for their patience! There were hitches, of course, including participants who would back out, or who would not cooperate. Vinz himself, at one point, almost backed out, because he did not want to go every Sunday. I persuaded him to continue, agreeing that we will only go every other Sunday, except for the last 3 Sundays, when the practices will be more intensive. He asked if his siblings also participated in modeling in the past. I said that they each have their own talents. His eldest sister Amaris writes well and has published articles in various media. His second sister, Issa, has a good voice and joins singing groups in school. His older brother, Lean, is our artist and is often tapped for school projects. I told him that he was the only one who participated in modeling. Although there were hitches, these were more than offset by the fun all the kids had, just being together, exchanging cellphone numbers, dancing to Waka Waka, or strutting their stuff like real ramp models. The parents watched with pride as, gradually, the kids overcame their awkwardness and gained confidence. Waiting at the sidelines for four hours each Sunday had its rewards! The final show was held on March 2 at 7 pm in UP Bahay ng Alumni. In the two final practices on February 26 and March 1, the organizers ran the whole program, complete with costume changes and performances. That in itself indicated to us parents that the show was going to be a huge success, seeing as how the whole thing was handled so professionally. One could also sense the kids’ excitement as the big date drew near. On the morning of the final show, Vinz revealed to me that it took a while for him to fall asleep the night before because he was quite nervous and shy. I assured him that he was doing very well, they had practiced many times, and he did all the things that the teachers and staff told him to do. And indeed the big night was a tremendous success! The audience cheered and clapped heartily as the models came out in pairs, first wearing their animal print costumes, then their streetwear with accessories, their formal wear (elegant suits and cocktail dresses) and their Filipiniana wear (barongs and Filipina dress). No matter that some made mistakes or forgot the exit routes. There were crowd favorites, like Vicvic and his partner Angela who delighted the audience with their poses and wide smiles, AJ and his partner Jellene who showed confidence in modelling, Monique who stood out with her natural poise, Joshua and Maria who danced the Waka-waka with such gusto. Friends and relatives cheered for their own. Our own family, and some of Issa’s friends gave our all-out support for Vinz. There were a lot of photo ops and Vinz had the opportunity to have photos taken with his friends in the SC group, as well as our guests who congratulated him. It was on the whole a very enjoyable event. In the end, there was an opportunity to thank the organizers, sponsors and staff who made the whole event memorable for the kids and their families. The event was also graced by ASP Vice President Peng So, Trustee Ging Viado, Executive Director Ranil Sorongon and her wife Ms. My. Our very ASP Dream Girls, Thara and Nica were also present at the event to entertain the audience with their heart warming songs. 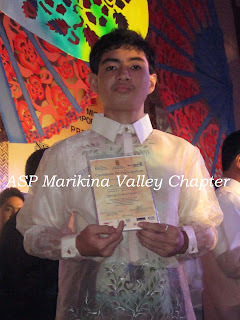 After the event, I know that Vinz was very happy with his accomplishment and that he will never forget the experience. You can contact ASP Marikina Valley Chapter President Alex Cabason at (0939) 466-8665 or alexcabason@yahoo.com. Hi Ms. Marivi! I am Teacher Joy I was with Vinz during his Nursery days in Sacred Heart Kindergarten Montessori School. I am so glad that Vinz has been making lots of progress in his studies as well as in many areas of his growth. Indeed, this is very encouraging for both parents and teachers who want to offer children with special needs a chance in the society. He has become an even more handsome young man. Congrats Vinz!